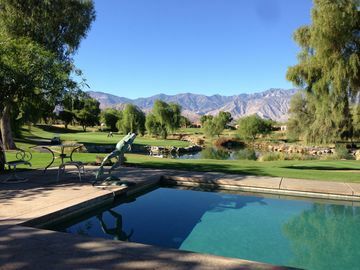 Mira Vista Rancho Mirage, CA is a newer, more exclusive neighborhood located in the Mission Hills area of Rancho Mirage. The luxurious homes in this development offer modern designs and upgrades, including high ceilings and landscaping features such as desert scenes and oasis settings. Views of the mountains surround this pristine development, and most of the Mira Vista homes are located on oversized lots and include infinity pools. There are about 307 homes in this development, and most of them have golf course frontage or lake views. Tee times at the Dye and Player golf courses at Mission Hills Country Club are available to residents of Mira Vista for discounted rates, as well. Homes are not cheap in Mira Vista, but are also not the most expensive listings in the Valley. From $600,000 on up to $1.2 million, there are properties available for anyone to purchase, and the homes were built between 2001 and 2004. The Homeowner’s assessments in this community are among the cheapest in Rancho Mirage, only costing homeowners $166 per month. This fee includes basic cable service. There are only two access roads to Mira Vista Rancho Mirage, cutting down on traffic and increasing the safety of your family. What better place to raise your family and enjoy life than in this pristine neighborhood of Rancho Mirage, which is known as the Playground of the Presidents? The homes themselves are located on the Gary Player course of Mission Hills Country Club, and also known as Mission Hills North. Mission Hills Country Club is within walking distance of Mira Vista, and features three of the best golf courses around. The Arnold Palmer course offers almost 6,900 yards of play, and is often one of the favorites of members. The Pete Dye Challenge course is nearly 7,000 yards, and true to its name in the difficulty of the course. The Dinah Shore Tournament course is the host of many annual events including the LPGA Kraft Nabisco Championship. It has over 7,200 yards of play, and is the course most used for professional events. The Mission Hills Country Club also has a 17 acre driving range, a chipping green, and four putting greens for practice, along with The Golf Academy at Mission Hills to help improve your golfing skills, no matter what level you’re at. Mission Hills sponsors many events each year, including: PGA Club Professional Championship, the U.S. Open Qualifier, the California State Open, the U.S. National Seniors, the LPGA Section Qualifier, and qualifying schools for both the PGA and LPGA. Mira Vista Rancho Mirage home ownership enables you to enjoy all the amenities of this lavish country club, simply by being a homeowner. If you’re interested in seeing the few properties that are available in this neighborhood, contact us today. We are able to help you find the home of your dreams in all aspects. We can set up tours, provide information, and help you decide what’s right for your home purchase. Don’t hesitate, or you might miss out on your dream home. Call us now to get started. If you would like to see property at Mira Vista Rancho Mirage, please call us at the numbers below. Were committed to helping you find the home of your dreams.